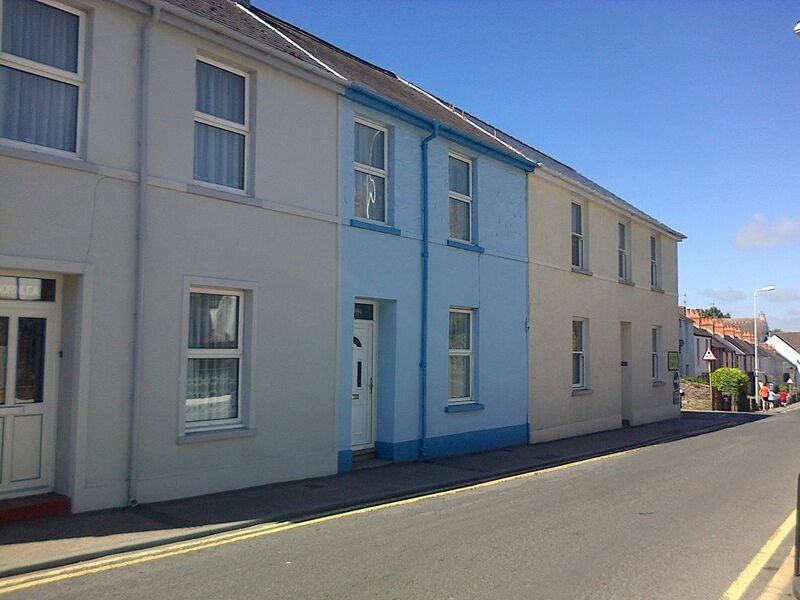 3 bedroom cottage in the town of Tenby. Located on Upper Park Road (a few doors down from Sainsburys), the cottage is just a couple of minutes walk to the town centre and all the amenities it has to offer. It is also a few minutes to both the south and north beaches on foot. The cottage has been recently refurbished and includes a living room, dining room, fitted kitchen, rear yard, double bedroom, twin bedroom, bunk bedroom and family bathroom. The property has free Wi-Fi and there is a television in the lounge. Our family has enjoyed visiting Tenby for many years. We have recently bought this cottage and renovated it from top to bottom so we can rent it out and enjoy it as a family when it is free. We hope you love it as much as we do. Its in a good location, 2 minutes from the 5 arches, close enough to both beaches and just 2 doors down from Sainsburys which is ideal for your conveniences. Bathroom suite with WC, wash hand basin, shower . Tiled floor and walls. Living room with 3 piece and 2 piece leather sofas, open door way to dining area with dining table which seats 6 people and can be extended further if required. Newly fitted kitchen, electric oven and gas hobs, fridge freezer, microwave, dishwasher, toaster and kettle. A range of cooking utensils. There are two local and very well regarded golf courses. Tenby golf course is ranked as one of the top five courses in Wales and is just a few minutes drive away from the cottage, the course is challenging and suits a more experienced player. Trefloyne Golf course is also within a few minutes drive and is a beautiful course and manor house with a range of facilities. Outside: A yard for hanging washing etc. Tenants are permitted to smoke outside. Cleaning / Towels / Linen / Maid service: The property will be cleaned and clean bed linen provided on Saturdays. Those guests staying for more than a week can request the property to be cleaned on the Saturday if they wish. My adult daughter and I stayed here for three days while visiting Tenby and the area. The location is great - it's a 5-minute walk to the old walled town. The lodging is comfortable and clean, with a well-stocked kitchen. The owner was very helpful and responsive. I would definitely stay here again. Great location, ideal for a family break. Lovely clean cottage, short walk to all of Tenby and a know ideal base for a family break. Clean, convenient and comfortable small house. Well equipped kitchen, small yard was handy for drying washing/ swimming things. Very short walk to either South or North beaches. Would be very handy for anyone coming by train or bus. We had a car and managed fine but had to park in the nearby multi storey (£3 per day). There were 4 of us, might have been a bit of a squash with 6. Although very close to Sainsburies it was remarkably quiet. Double bed comfy and rooms not overlooked. Tenby was a great place to spend a week! This 3 bedroom flat is steps from Sainsburys, a minute from the bus stop/tourist info and minutes from the train station. It's very quiet and only about 5 minutes to the 5 arches entrance to Tenby. The wetsuits were especially welcome. Very comfortable and highly recommended. A wealth of local attractions available from kite surfing and surfing, fishing trips, sailing, trips to Caldey island, Manor Park & Heatherton, Folly Farm, Oakwood theme park, Bluestone, fantastic local walks, golf and many other attractions to discover! Tenby has beautiful sandy beaches. The cottage is just a few minutes walk from both the North and South beaches (virtually equidistant). The beaches are fantastic places to relax on sunny days and also great for those who like to brave the elements on the cold and blustery days. A short drive (30-40 mins) will take you to Skomer island the home of the puffin. These must be the most endearing birds ever and best seen between May to July. Other amazing things to do and see include canoeing amongst seals and the natural blue lagoon found at the breached quarry at Abereiddy beach. Long stay car parking is available in the multi storey car park by Sainsburys supermarket. This is located just a few meters up the road. Pembrokeshire County Council have advised 1 weeks parking is available for approx £12. A welcome pack will be available in the property with information ranging from local activities to restaurants and local take away menu's. Booking Notes: A 25% non refundable deposit is required at the time of booking and full payment must be made 45 days in advance of the holiday start date. The owner reserves the right to cancel the holiday if full payment is not made 35 days in advance of the booking (without refund of the deposit). Should you decide to cancel your break, we will endeavour to fill the space and if we can for the same price agreed we will refund all monies. Special winter offers and short breaks available. Changeover Day: Changeover day is a Saturday, however, this can be flexible depending on other bookings, particularly out of peak season, please contact us to discuss further. Notes on prices: We can accept and prefer card payment over the phone, debit cards are free, credit cards carry a 2.5% booking charge. We can also accept bank transfer and cheques with adequate clearance time. We are happy to negotiate on rates and length of stay out of season, please call to discuss further. Special winter offers and short breaks available.